Rebounding Benefits the Body in 30 Healthful ways and more! In the spring of 1981, 28-year old Samuel J. Kofsky of Manchester, New Hampshire, a Ph.D. candidate attending the School of Economics at Dartmouth University, lay in a Hanover, New Hampshire hospital room, recovering from the surgical excision of an apparent cyst. Soon after the operation, his surgeon and an oncologist entered the room and walked hesitantly to the foot of the patient's bed. The surgeon said, "Sam, I don't want to shock you, but our hospital pathology department reports that your biopsy shows you have a connective tissue cancer. It's a rare form of fibrosarcoma, which develops suddenly from small bumps on the skin like what I thought was your cyst. Sam, I'm sorry to tell you that there's an 80% chance it will take your life within four years." The oncologist had come along to confirm the young man's diagnosis and prognosis. Soon Sam Kofsky found himself faced with daily radiation therapy and then intravenous chemotherapy which the late Senator Hubert H. Humphrey had once referred to during a TV interview as "bottled death!" For graduate student it was devastating treatment routine. He felt that his body was being assaulted, burned, and poisoned. To sustain himself through chemotherapy, and to believe that he was doing something positive to help himself, Mr. Kofsky took up exercise of the aerobic type. Aerobics is the steady state of exercising which, when performed over a period of months or years, develops the cardiopulmonary system's ability to take in and utilize more oxygen. This elevated amount of "oxygen uptake" increases cellular metabolism of oxygen molecules as nutrients. Besides competitive team sports such as football, basketball, racquetball and tennis, aerobic exercises include speed walking, running, sustained jogging, swimming, rowing, bicycle riding, calisthenics performed in a specific time frame, and rope jumping. As it happens, Mr. Kofsky became intrigued with rebounding, which is similar to jumping rope except that it's performed on a kind of mini-trampoline. Since the jumping surface of a rebounding device has cushioning spring to it, any jarring to one's ankle joints, knees, and back is removed. While rebounding, too, a person can work out outdoors or indoors and simultaneously speak on the telephone, watch television, listen to music, and do other things. Jumping on the mini-trampoline is the ultimate aerobic exercise able to be performed anywhere, even in hotel rooms with a carryon, foldable-type rebounding device. As he was being treated with toxic chemicals, Mr. Kofsky engaged in rebounding for his health several hours every day, including 60 minutes before breakfast, lunch and dinner. Whenever possible, he carried his rebounding device out-of-doors to bounce under the trees. Also he ate a nutritious diet, took supplements, and engaged in other exercises for diversity. At regular intervals he swam a full mile at the local health club, furiously punched the heavy bag, and ran a consistent six-minute mile over a ten-mile course. His weight plummeted 36 pounds from a high of 193 not from cancer, but from his strenuous amount of daily exercising. The exercise was good psychologically for Mr. Kofsky, since so much activity had him believing that he was "winning" his battle against cancer. Philosopher Michael Novak has described winning as "a form of thumbing one's nose, for a moment, at the cancers and diseases that, in the end, strike down all of us." The patient pushed himself harder each day. By the end of a year, he had doubled his daily rebounding time and was seemingly able to go into a meditative state even as he bounced on the device. Mr. Kofsky additionally increased the number of swimming laps, miles run, and time punching the bag. He gained a new confidence. Photograph 1. Shown is a NEEDAK rebounding mini-trampoline on which an exerciser is jogging without feeling the jarring effect of landing on pavement. I met Sam Kofsky 120 feet below the ocean's surface at Grand Cayman Island when we buddied during a morning scuba dive on the North Wall's underwater drop off. Returning aboard our dive boat, he enthusiastically told me of his involvement with rebounding. I told him then of my having authored a book on the same subject. We met often during that vacation trip and spoke about other alternative methods of healing. Our conversations took place in January 1995, and we've stayed in touch since. Kofsky, now age forty-two, had already lived well past his prior dire prognosis. He attributed the circumstance of his thriving to his jumping for health and life. The same time that he took chemotherapy and engaged in his prolonged exercise therapy, the Dartmouth student finished his doctoral thesis. He is now an assistant professor of economics at a midwestern university. Dr. Kofsky needs no chemicals for cancer and feels more fit than ever today. Perhaps the malignancy still lurks somewhere in his body, for once cancer has been present the potential for its return always remains. Still, this economics professor knows that he has fought it off the best way he could. Dr. Kofsky continues to rebound and participate in other sports activities. It causes muscles to perform work in moving fluids through the body to lighten the heart's load. It expands the body's capacity for fuel storage and endurance. 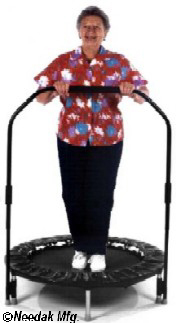 Sometimes, for people who feel unsteady on their feet or for the elderly, handicapped, and disabled, a stabilizing bar may be added to the rebounder's frame. It's attached to two of the frame's legs so that the individual needing more security can hold onto this bar and still bounce aerobically. Photograph 2. Shown is the NEEDAK Soft Bounce rebounder with a stabilizing bar attached. This bar offers those who feel unsteady on their feet a greater sense of security while rebounding. Jumping on the mini-trampoline is remarkably un-strenuous on the joints. There's no solid ground to suddenly stop the bouncing of your feet. Your movements are perfectly safe, and they make the effect of gravity beneficial. By working against constant gravitational pressure while bouncing, you resist the Earth's pull. Your resistance is subtle, but it builds cellular strength. Rebounding's alternating weightlessness and double gravity produce a pumping action which pulls out waste products from the cells and forces into them, oxygen and nutrition from the bloodstream. Your rate of rebounding will vary, depending on how vigorously you bounce and how high you lift your feet off the mat. Rebound exercise offers the ideal aerobic effect with almost any rate of performance, because it fills all the requisites of an oxygenating exercise. It's likely that the vast amount of oxygen taken in by Dr. Samuel Kofsky over a sustained period was the true source of his cancer remission. Rebounding might be considered a precursor movement for better achieving the oxygen therapies. An advocate of rebounding for athletic conditioning, Dr. White uses the rebounder in his rehabilitation program at UCSD. "When you jump, jog, and twist on this (jumping) device you can exercise for hours without getting tired. It's great practice for skiing, it improves your tennis stroke, and it's a good way to burn off calories and lose weight," said Dr. White (see Table A). "My students tell me it's so much fun that they often exercise on the Rebounders for their own enjoyment." Total Calories Spent Comparing Jogging@ 5 MPH to Rebounding(2). Depending on the quality, rebounding devices may be relatively low in cost, especially a department store model that's no more than a toy. Bouncing on such poorly-constructed models, usually imported from Asia, may actually be harmful to one's muscles, joints, and nerves. There's no yield to them and the abrupt jarring effect is the same as landing on the floor. My recommendation is that one should avoid purchasing these cheaply priced models. Most important for excellent rebounding is the mat material. It should give no stretch during the downward landing, while at the same time providing a resilient rebound. Such a mat will be made from Permatron material, which has a smooth finish. The Permatron is resistant to ultraviolet rays, doesn't break down as do other fabrics, and allows no moisture absorption. Part of the specifications for a perfect rebounder is that its mat will be sewn together using 5760 stitches of high-grade nylon thread with two layers of strong polypropylene webbing stitched around the mat's edges. To jump for health, rebounding devices that exhibit all of these features of excellence I've been describing are the Needak Soft-Bounce Rebounders. They meet all of these specifications for the ideal rebounding device. The stabilizing bar is an optional accessory that is easily attached to the Needak rebounder.